Equipment Upgrades - Sage Automation Inc. The picture on the left shows the old electrical control system. The picture on the right shows the new panel Sage Automation built to replace it. Sage Automation can replace an old control system with a new modern one. Upgrade work is not just limited to electrical hardware. As robotic automation systems begin to age many times their reliability, effectness, and accuracy begin to decline. Down time costs money both in repairs and lost productivity. Sage Automation upgrades can solve these issues at a reasonable cost by retaining the existing gantry frame and many of the original parts. Sage Automation offers various types of upgrade packages: new servo motors, rework of electrical systems including cabinets, and complete system refurbishing with new paint/powdercoating, even new gearing, rails, and bearings. By upgrading with a retrofit you can increase speed, reliability, and take advantage of improvements in technology that have occurred since your system was built. Sage upgrades are not limited exclusively to Sage robots and machines. Sage’s service department may be able to help with equipment made by other robotic manufacturers including competitor’s aging systems. Sage Automation can also help with reprogramming and modifications to your system’s existing code. 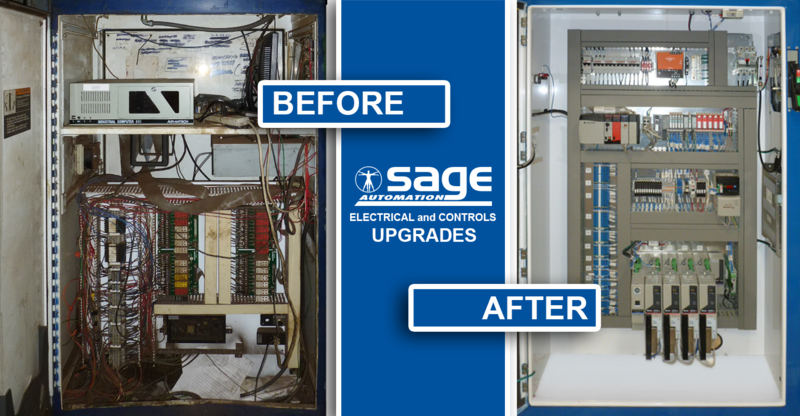 Contact Sage Automation to see if your outdated system is eligible for a Retrofit Upgrade by Sage Automation’s Service Department. In addition to upgrades Sage Automation can help you relocate your system. Sage is an Authorized Fanuc Integrator and can help relocate and reprogram your Fanuc Arm Robot as well.